Founded in 1965, the Israel Museum in Jerusalem ranks as the largest cultural institution in Israel and one of the world’s top archaeology and art museums. The extensive collection of nearly half a million objects, which contains works spanning from prehistory to today, is divided into Fine Arts, Archaeology, Jewish Art and Life collections and includes the world’s most extensive collection of biblical and Holy Land archaeological pieces. 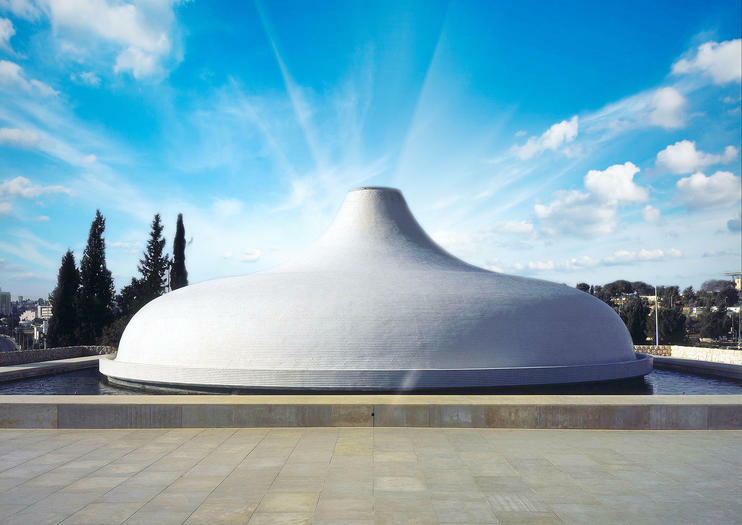 Within the galleries and exhibits of the recently upgraded 20-acre museum campus, visitors will find find the Shrine of the Book where the Dead Sea Scrolls are kept, as well as the Billy Rose Art Garden, considered among the best outdoor sculpture gardens of the twentieth century. Sculptures by masters like Pablo Picasso, Auguste Rodin and Henry Moore are scattered throughout. English audio guides for several permanent exhibitions, including the Shrine of the Book, are included in the admission fee. The codes in the Bible (Torah) expand the mind and bring hope. The lecturer has been part of the inner circle of codes researchers in Israel for over 20 years, and has appeared on History Channel and other documentaries. Some codes are like a signature of the Bible's Author. Others signal an era of world peace, centered around the site of the Holy Temple. That is the very site which our balcony overlooks. Still other codes reflect historical and current events. Learn how the Bible/Torah is compared to thousands of other texts and no text has ever been found which remotely compares. "Virtual reality" is a play on words, not an actual part of the experience, and yet the goal is to change one's view of reality for the better. Gasps of wonder and hard questions are equally welcomed. In English normally, but Hebrew groups can be accommodated. There is nothing like face to face communication. I may also discuss some intriguing unpublished aspects. Have you always wondered about the Jewish lifestyle and traditions and or life in the Old City of Jerusalem. Do you have many questions you want to get answered or are you just curious. You have picked the right place. Part of this activity is a lookout at a stunning view of the Western Wall and the Temple Mount. This activity is accompanied by hot and/or cold drinks and snacks depending on the season. Most of the activity is indoors. Go deep into Israel’s art, history and culture on a 6-hour, private tour of the Israel Museum with an experienced guide. Enjoy the flexibility of a private tour to visit just the exhibits that interest you most as you travel from ancient times to Israeli Independence. Take in the Dead Sea scrolls and see a model of Jerusalem’s Second Temple, then learn about life in traditional Jewish communities. Explore Israel’s art in a gallery of local works, and enjoy a Zen garden that celebrates Jewish sculpture and the Jerusalem skyline. Enjoy your full day Christian Protestant tour from Tel Aviv to Jerusalem with a highly qualified tour guide, specialist in Christianity and Holy Land History. This exciting full day Jerusalem tour encompasses the most important places for the Protestant Christians worldwide. This one of a kind Highlights tour will have a significant impact on your life: it's a tourism jam full of colorful places, unique encounters, and real historical path. 8 Nights of pure fun and joy!